Book 5 is now live on Amazon and Barnes and Noble!! Woohoo!!! And it’s already got a 5-star review from a reader. I’m speechless! I’m doing a Tour of Fives Blog Tour (that actually started last Friday) to celebrate. I’ll have more details posted soon. Official launch date is Thursday, June 6th, and one of the Fives posts will be on the misterio press site that day. 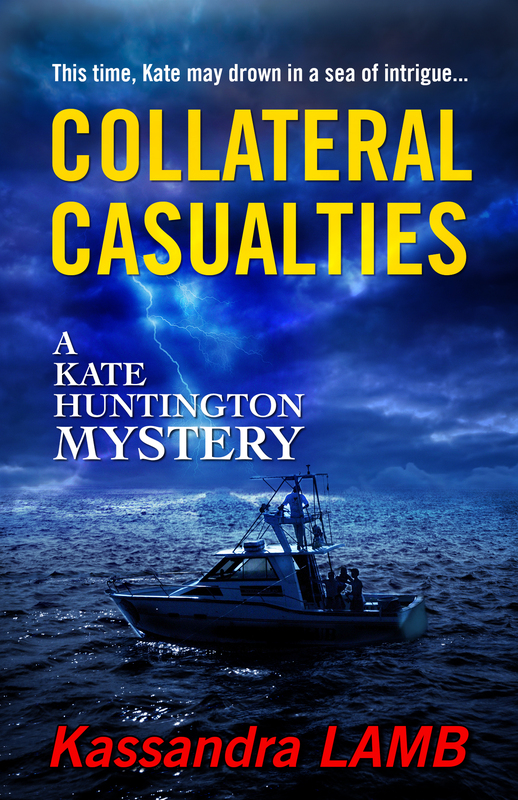 Collateral Casualties will be on sale at an introductory price of $1.99 through June 12th. This book took a long time to polish but the feedback I’ve gotten from early readers is that the time was well spent. Enjoy! And thanks so much for your support!! When a former client reaches out to psychotherapist Kate Huntington and reveals a foreign diplomat’s dark secret, then dies of ‘natural causes’ just days later, Kate isn’t sure what to think. Was the man delusional or is she now privy to dangerous information? Soon she discovers her client was totally sane… and he was murdered. Someone is now trying to eliminate her, and anyone and everyone she might have told. Forced into hiding, she and her husband, Skip, along with the operatives of his private investigating agency, struggle to stay one step ahead of a ruthless killer. Skip and his P.I. partner are good investigators, but this time they may be in over their heads… and they could all end up drowning in a sea of international intrigue. This book, like all those in the series, is designed to work as a stand-alone as well. Here is the awesome cover for Book 5. It will be out in two to three weeks, and my beta readers tell me it is the best one yet. Below the cover is the blurb. Told ya it was awesome! Thank you, Martina Dalton of The Authors’ Redroom. Soon she discovers her client was totally sane… and he was murdered. Someone is now trying to eliminate her, and anyone and everyone she might have told. Forced into hiding, she and her husband, Skip, along with the operatives of his private investigating agency, struggle to stay one step ahead of a ruthless killer. Skip and his P.I. partner are good investigators, but this time they may be in over their heads… and they all could end up drowning in this sea of international intrigue. Like all the books in the series, this is also designed to work well as a stand-alone. I’m currently hard at work on Book 6 (about two-thirds through first draft) and have started the next Kate on Vacation novella. I also have an outline for Book 7, but I’m resisting the temptation to work on it until I have the other two projects completed.